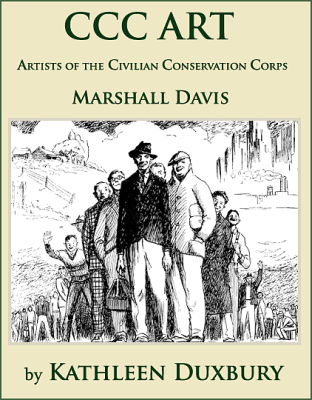 CCC ART – Reima Victor Ratti – Artists of the Civilian Conservation Corps is now available at: B&N, Amazon and soon will be available at the Bess Bower Dunn Museum. This is a story of a young, New Deal artist with a romantic name, Reima Ratti. Born in Waukegan, Illinois in 1914, he was like so many young boys of his generation. Young men who came of age during the jobless years of the Great Depression. Ratti joined the Civilian Conservation Corps (CCC) as a regular enrollee to help himself and his family. As a trained, but untried artist, he brought along his sketchpad, pencils and brushes. What transpired, during his CCC artist days and beyond, would set him on a path to history. 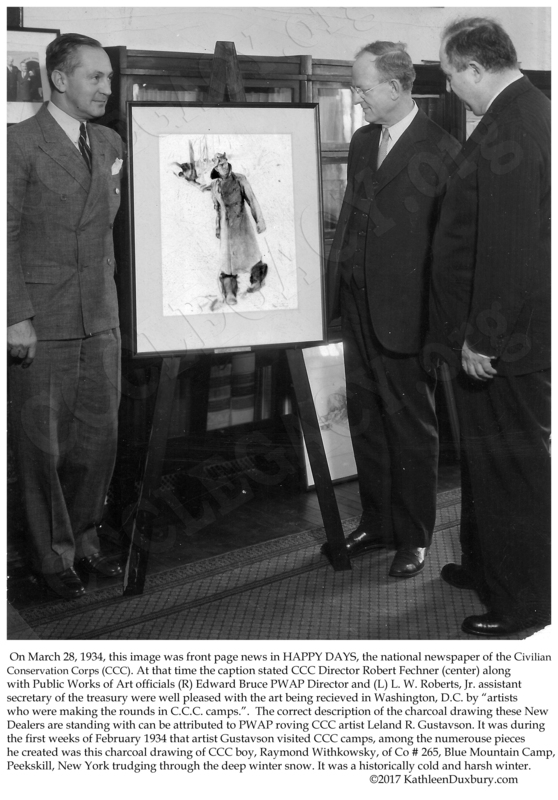 During the Great Depression persistence and talent earned Frank Cassara a young, untried artist his place among the greats in New Deal art history. 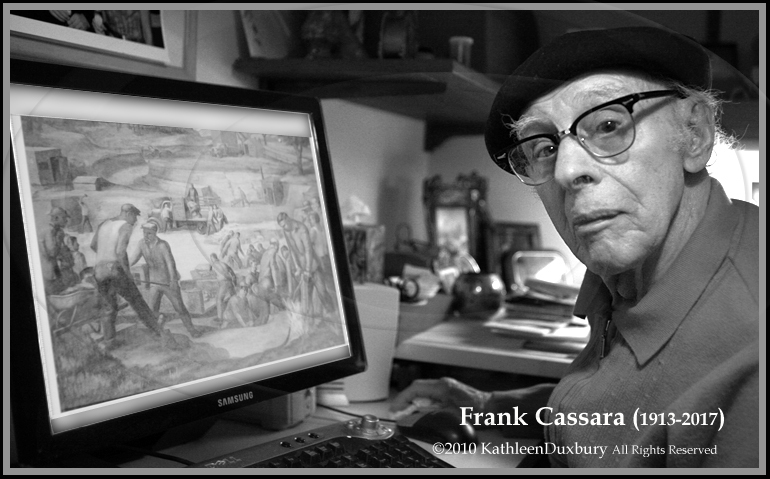 The last of the New Deal Civilian Conservation Corps (CCC) artists, Frank (Francesco) Cassara, born March 13, 1913 in Partinico, Sicily died January 13, 2017, in Ann Arbor, Michigan – two months shy of his 104th birthday. In the fall of 2010, Frank Cassara and his daughter, Francisca, graciously welcomed me into his Michigan home and studio. While giving me directions they voiced concerns with traffic I might encounter en-route; a football game was scheduled at the University of Michigan. If there was traffic I never noticed, but do recall the Spartans were not the only winners that weekend. Frank was then 97 years old, in a wheelchair, soft spoken and was quietly reflective as I questioned him about his time and special circumstances as an Artist/Enrollee with the Civilian Conservation Corps (CCC) in Illinois during the Great Depression years. Initially we sat in the living room of his home. Frank watched as I arranged my papers, camera equipment and hooked up the audio recorder all while explaining the who and whys of our New Deal research, extensive travels and how we search for CCC art, artists and stories. Frank apologized for what he believed would be unproductive time and wasted travel for me; explaining it had been years (authors note – 75+ years) since his assignment to a CCC camp and he really couldn’t remember much. Truthfully, I didn’t know what to expect as I handed Frank copies of CCC camp photographs and letters. The documents were dated 1934 – 1935, years when Frank was 21 years of age, living in Detroit, Michigan and desperate for work. He was writing or approaching anyone or any agency he thought might be of assistance, repeatedly. In 1939 the Federal Art Program Poster Division utilized a revolutionary printing process to produce a historic calendar. 78 years later the calendar dates are the same. Presenting a timely opportunity to enjoy a years worth of New Deal American art once again. 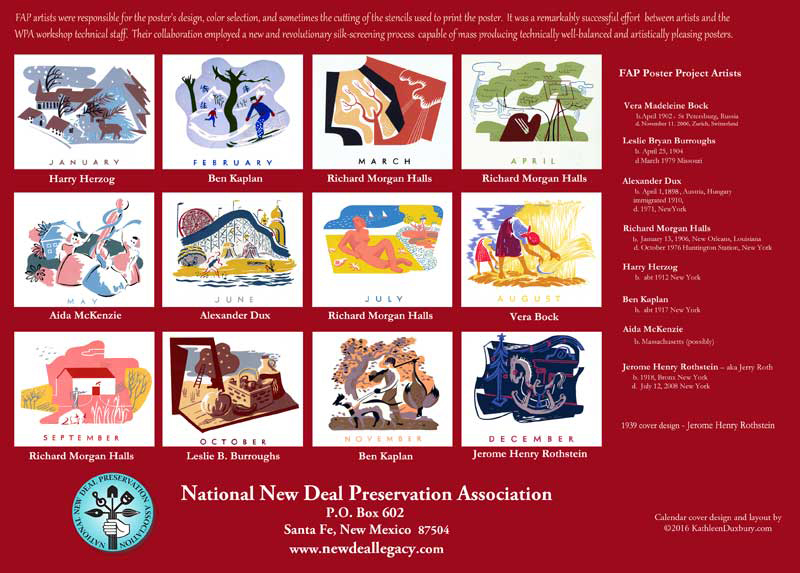 National New Deal Preservation Association 2017 calendar -A revitalized version of the original 1939 WPA Federal Art Project (FAP) calendar. Featuring the work of eight artists employed by the NYC Poster Division. 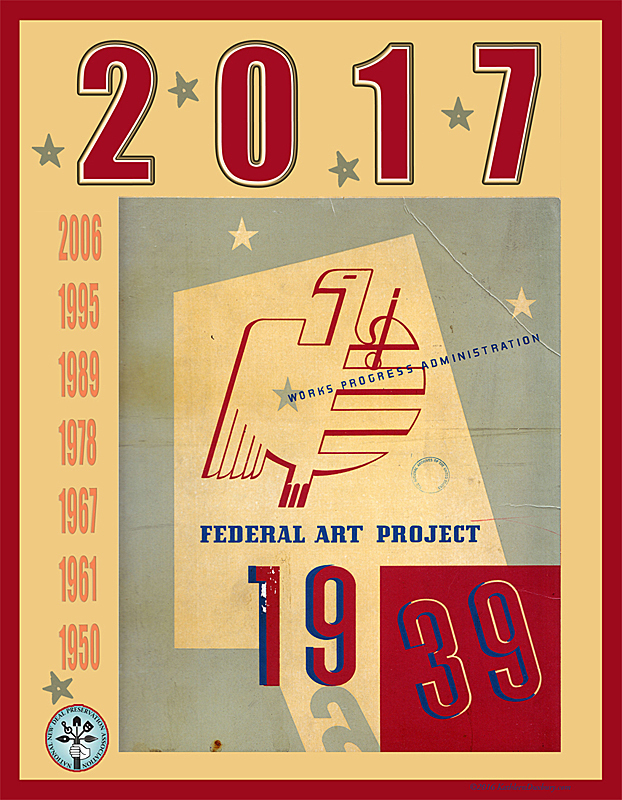 At times New Deal research will go off in unexpected directions such as the Federal Art Project (FAP) administered by the Works Progress Administration (WPA). Because several CCC artists would later find employment with other government art programs searching selected records from these federal agencies can provide a better understanding of an artists journey. On a recent trip to the National Archives and Records Administration (NARA) in College Park, Maryland multiple boxes were requested from WPA Record Group 69. Midway through a container labeled FAP State Offices New York was a folder marked 1939 FAP. Inside this archival envelope were original poster prints from a FAP calendar for 1939; considering their age the paper stock was still firm and the images remained bold and impressive. A revolutionary new silk screened process, designed by a WPA artist, was used for these poster prints. Enabling mass production with results considered, in the 1930’s, to be technically superior and artistically pleasing. A quick check revealed that the calendar dates for 1939 are the same for 2017. How fortunate to find these vintage 78 year-old federal art prints and how fitting to revitalize these images for another years use. Now available is a vibrant and historic 2017 calendar, 8.5″ x 11″ full color, 14 month wall calendar offered exclusively through the National New Deal Preservation Association (NNDPA) website. Working with these vintage images created a flood of questions . . .
What was the FAP? Who were these eight artists? What is the story behind this calendar – for whom, why and how was it printed? 1939 was a year that changed world history. The publication of the original 1939 WPA/FAP calendar was done in a spirit of a good will. Unfortunately, this well meaning gesture was ill-timed and ill-fated. But that’s another story . . . Between 1934-1937 the CCC art program encompassed the lower forty-eight states. Researching this quiet part of American art history requires extensive travel and investigation. Using a vintage motor home allows the best access to sleuthing within the parks, repositories and other collections that house this New Deal history. 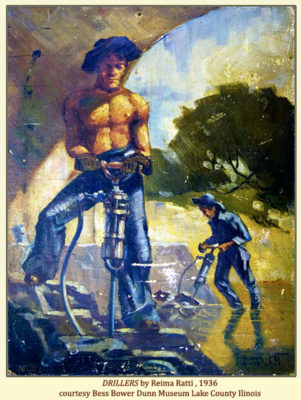 Often crucial information is found by going to the source; clues that lead to the art, artists and stories of the CCC. We are appreciative for this article which draws attention to a quiet part of America art history and our efforts in researching the Civilian Conservation Corps and the New Deal CCC art program. 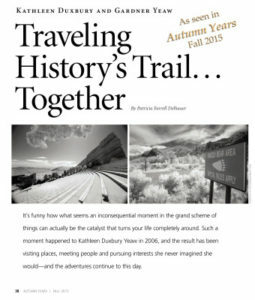 “Traveling History’s Trail . 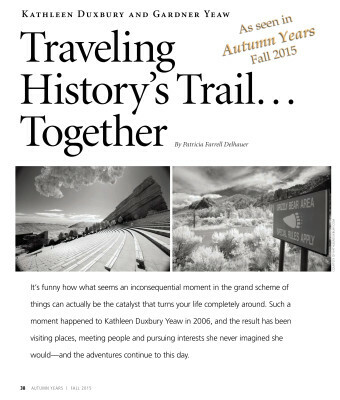 . . Together” written by Patricia Farrell Delhauser along with the design and layout by Heidi Gross appeared in the Fall 2015 edition of Autumn Years magazine. The complete article with images may be viewed on my website KathleenDuxbury.com along with information on the first in a series that highlights the CCC artists and the CCC art program.